Robin van Persie's powerful strike capped an impressive win for Manchester United over Hull and offered the perfect response to those who have questioned the Dutchman's early-season form. Those critics included Van Persie's manager Louis van Gaal, who kept the striker in his starting line-up despite saying he had a "very bad game" against Arsenal last Saturday. By the time Van Persie turned on the edge of the area to arrow an unstoppable shot into the top corner in the 66th minute, United were well on their way to a routine victory. Chris Smalling had scrambled them into an early lead, and any real doubt about the outcome disappeared when Wayne Rooney added a second before half-time. As well as Van Persie's return to scoring form more than a month after his last Premier League goal, United could celebrate the return of fellow striker Radamel Falcao, who came off the bench to replace him after nearly six weeks out through injury. That added a shine to three points that returned United to fourth place in the table only a few hours after Arsenal had moved above them. While United are building momentum and confidence despite suffering another injury setback - Angel Di Maria limped off just before Smalling scored - the Tigers appear to be in freefall. This was their fourth straight defeat, and they are now only out of the bottom three on goal difference and a point off the foot of the table. Hull have managed only one league win since the opening day of the season, the same afternoon United last lost at Old Trafford. Former Manchester United captain Steve Bruce has never beaten his former team during his 16-year managerial career. This was his 17th defeat in 21 attempts, with draws accounting for the other four meetings. Their home form was never convincing under David Moyes, but Van Gaal seems to have reintroduced the swagger and self-belief that was their trademark under Sir Alex Ferguson. They were helped on Saturday by a Hull team that offered little ambition and limited resistance. Tigers boss Steve Bruce has a miserable record against the club he played for, and a first win in 21 attempts against the Red Devils as a manager never looked likely. The Tigers even assisted United with their first goal - goalkeeper Allan McGregor helping the ball over the line as he tried to keep out Smalling's prodded shot. Goal-line technology confirmed it went in. With Michael Carrick and Juan Mata dictating play and spraying passes in midfield, Di Maria's early exit, clutching the back of his thigh, did not make a difference. United were dominating possession - they had 76% of the ball - and with Hull defending deep in their own half, more goals seemed just a matter of time. Rooney all but secured the three points after 42 minutes when Van Persie teed him up to bend a low shot into the bottom corner from 25 yards. Van Persie made sure of the victory midway through the second half, departing to a standing ovation when he was replaced by Falcao. The Colombian looked set to mark his return with a goal but Michael Dawson's remarkable goalline clearance denied him from close range after Hull's defence was torn apart again. Former Manchester United midfielder Paul Ince on BBC Match of the Day: "Louis van Gaal said it would be a work in progress. He's had a nightmare with injuries, especially defensively. His ambition is to finish in the top four, he's not looking to win the league. They are slightly improving game by game. "Hull boss Steve Bruce has got plenty of experience. It won't be a case of panicking just yet but he knows they have to start creating and scoring goals. He'll be disappointed with the performance, that's for sure." Match ends, Manchester United 3, Hull City 0. Second Half ends, Manchester United 3, Hull City 0. Delay in match Wayne Rooney (Manchester United) because of an injury. Corner, Manchester United. Conceded by Andrew Robertson. Offside, Hull City. Allan McGregor tries a through ball, but Sone Aluko is caught offside. Attempt blocked. Falcao (Manchester United) right footed shot from very close range is blocked. Attempt blocked. Falcao (Manchester United) right footed shot from the centre of the box is blocked. Assisted by Juan Mata. Darren Fletcher (Manchester United) wins a free kick in the defensive half. Corner, Manchester United. Conceded by Michael Dawson. Attempt saved. Nikica Jelavic (Hull City) header from the centre of the box is saved in the top left corner. Assisted by Ahmed Elmohamady with a cross. Substitution, Hull City. Stephen Quinn replaces Mohamed Diamé. Substitution, Hull City. David Meyler replaces Robbie Brady because of an injury. Substitution, Manchester United. Darren Fletcher replaces Antonio Valencia. Delay in match Sone Aluko (Hull City) because of an injury. Substitution, Manchester United. 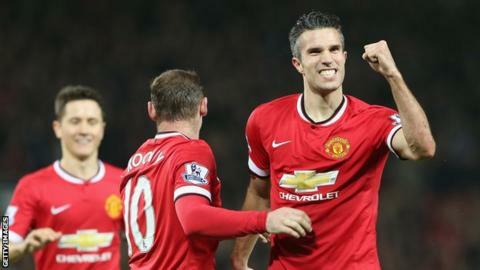 Falcao replaces Robin van Persie. Attempt missed. Marouane Fellaini (Manchester United) header from the right side of the six yard box misses to the left. Assisted by Ashley Young with a cross. Offside, Hull City. Allan McGregor tries a through ball, but Nikica Jelavic is caught offside. Goal! Manchester United 3, Hull City 0. Robin van Persie (Manchester United) left footed shot from outside the box to the top left corner. Assisted by Ander Herrera. Robin van Persie (Manchester United) wins a free kick in the attacking half. Attempt missed. Nikica Jelavic (Hull City) header from the centre of the box is too high. Assisted by Robbie Brady following a set piece situation. Offside, Manchester United. Marcos Rojo tries a through ball, but Wayne Rooney is caught offside. Delay in match Robbie Brady (Hull City) because of an injury. Offside, Manchester United. Michael Carrick tries a through ball, but Robin van Persie is caught offside. James Chester (Hull City) is shown the yellow card for a bad foul.